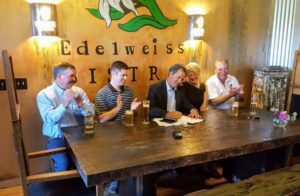 Governor Steve Bullock paid a visit to Missoula’s Bayern Brewing Co. Monday afternoon for a ceremonial signing of House Bill 541. Approved by the 2017 Montana Legislature, the bill raises the production cap on Montana breweries who wish to sell beer for on-premise consumption from 10,000 bbls to 60,000 bbls of annual production. Erik Somerfeld, Rep. Adam Hertz, Rep. Ellie Hill Smith, and Jürgen Knöller (l-r) applaud Governor Bullock as he signs HB 541. “It’s a real simple equation,” said Erik Somerfeld, a Montana barley grower speaking for the Montana Farmers Union. 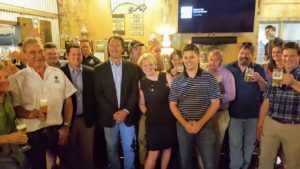 “More beer production means more malt barley being used, means more malt barley needs to be grown, which means more money in the farmers’ pockets, which is good for the Montana economy. HB 541 was co-sponsored by a pair of Missoula Representatives from opposite sides of the political aisle, Ellie Hill Smith (D – Missoula) and Adam Hertz (R – Missoula). “It’s been a wild ride,” said Rep. Hertz of the process to get to this point. Bayern is not the only brewery to be helped by the bill. HB 541 will allow KettleHouse Brewing Co. to add a taproom to its new production facility in Bonner, adjacent to the new amphitheater. Big Sky Brewing Co., the only Montana brewery that has never been allowed to sell pints, will be allowed to begin selling beer for consumption at the brewery’s existing taproom. The bill also relieves the pressure on several other Montana breweries which have indicated an intent to significantly increase production over the next few years. HB 541 takes effect on October 1.